President Trump has boldly decided to expose China’s economic strategy to the global community and challenge it head-on. China is being forced to come to terms with the fact that business, as usual, cannot continue indefinitely. My sense is that Wolf overstates the risks inherent in the Trump administration’s new and comprehensive approach to China. Yes, the Vice President’s speech was intended to mark a new era in the US-China relationship: the end of a period of illusion and delusion, and the end of decades of a U.S. policy – dating back almost five decades to President Nixon’s “opening to China” – in which promoting Chinese economic growth became an American priority for humanitarian reasons and, until 1989, to counterbalance the Soviet Union, but also from a belief that modernization would foster a more liberal China, one that would be a “responsible stakeholder” on the global stage. This policy, of course, was a popular and frequent target of attack by candidate Donald Trump in the 2016 campaign, who argued that America’s economic policy elites had sold out our country, and especially our factory workers, in a quest to produce goods more cheaply in China. Whether it be controlling the heights of economics through its imperialist Belt and Road initiative or through state-owned enterprises, China is willing to weaponize the massive capital at its disposition to subsidize attempts to gain control of a dazzling array of strategic assets, whether it be ported such as Hambantota in Sri Lanka to get prime choke point real estate in the Indian Ocean, or global telecommunications networks through companies like Huawei to gain access to sensitive data and control over the central nervous system of forthcoming global 5G systems. The new consensus in the Trump administration on China, goes well beyond criticism of deindustrialization of the American heartland or Chinese currency manipulation. And this behavior, which entails forced technology transfer, intellectual property theft, and the regular use of “back door” chips to communicate sensitive data, has given China an unfair trade advantage in ways that defy both the WTO and the imagination. There is, in fact, a broad political consensus in the United States, across both political parties and among both supporters and foes of President Trump, that China itself is responsible for the growing opposition it has aroused among both elites and average Americans. No less a figure than former Treasury Secretary Hank Paulson, who made his name at Goldman Sachs as an early 1990s investor in China, criticized China for failing to open its economy to foreign investment as promised during the debate over Chinese accession to the WTO in 2001. In a widely cited speech in Singapore, Paulson noted how reforms peaked under President Jiang Zemin, with both Hu Jintao and Xi Jinping centralizing control under the Communist Party. And beyond the criticism offered by Paulson, there is growing concern about crackdown on the free flow of information, the centralization of authority under Xi that includes the disappearance of hundreds of key Communist Party cadres, the forced exile of over one million Uighurs in “re-education” camps designed to eradicate their culture, the creation of a “social credit system” designed to deny economic livelihood to dissenters of any kind, and China’s increasing use of facial surveillance and big data to intrude on the privacy of its citizens. There is abroad political consensus in the United States that China itself is responsible for the growing opposition it has aroused among both elites and average Americans. Against this backdrop, the U.S. government has laid down significant trade demands on China and placed $250 billion in tariffs designed to punish China for unfair and discriminatory trade practices, including massive intellectual property theft. Significant tensions notwithstanding, we are not on the verge of a new Cold War between the U.S. and China. First, President Trump and President Xi communicate regularly and enjoy good personal chemistry. Second, the economic ties between the USA and the PRC run deep and the two countries cannot easily disengage from each other. While there are areas of potential significant military tension – the East China Sea, the South China Sea and the Taiwan Straits – the Trump administration, through its free and open Indo-Pacific Strategy developed in full partnership with Japan and other allies is taking action to signal clearly to the Chinese what we often failed to signal to the Soviet Union under Stalin at the end of World War II: that there would be increasing cost to China’s attempt to dominate the region. Significant tensions notwithstanding, we are not on the verge of a new Cold War between the U.S. and China. President Trump as disrupter-in-chief has boldly decided to expose China’s economic strategy to the global community and challenge it head-on. Companies are now on alert that manufacturing in China poses an immense threat to their intellectual property and to the data of their clients. Countries considering partnering with “Belt and Road” are now on alert that China’s intent is rapacious – and that you risk losing key infrastructure assets to China in the process. Combined with the impact of U.S. tariffs, China is being forced to come to terms with the fact that business as usual – including forced technology transfer, IP theft and back door engineering – cannot continue indefinitely. Countries considering partnering with “Belt and Road” are now on alert that China’s intent is rapacious – and that you risk losing key infrastructure assets to China in the process. Xi Jinping realizes the challenge is immense – and while he has yet to offer a serious counter to America’s demands, he has also avoided the route of his predecessors in stoking up popular, anti-American anger through state-owned media. It is up to Xi to decide what course of action to take. 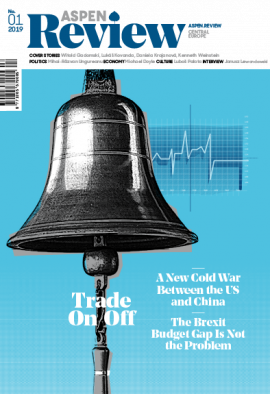 Martin Wolf, “The US Must Avoid a New Cold War with China,” Financial Times, 30 October 2018. This argument was made through newly declassified documents by Michael Pills- bury in his The One Hundred Year Marathon: China’s Secret Strategy to Replace America as the Global Superpower (MacMillan, 2015), a book that has been widely read and drawn significant praise from key administration officials.